一种光学装置被用于监测埋置在哺乳动物的组织中(例如，皮肤下)的植入物。 An optical device for monitoring is embedded in a mammalian tissue (e.g., the skin) of the implant. 该植入物接收来自该光学装置的激发光，并发射由该光学装置所检测的光，包括分析物相关光学信号。 The implant receives the excitation light from the optical device, and light emitted by the optical detecting means comprising an analyte associated optical signal. 由于水合作用、血液灌注和氧合作用中的变化，组织的散射和吸收特性随着时间而变化。 Since hydration, changes in blood perfusion and oxygenation of the tissue scattering and absorption properties vary with time. 该光学装置布置有光源、滤光片和检测器，以发送激发波长范围内的激发光并测量检测波长内的发射光。 The optical device is arranged a light source, filter and detector, to transmit the excitation light in a wavelength range of the excitation and measuring the emission of light in the detection wavelength. 组织中光散射和吸收的变化(例如漫反射率)被监测。 Light scattering and absorption in tissue changes (e.g., diffuse reflectance) is monitored. 该光源、滤光片和检测器也可以用于监测组织中的自身荧光以校正自身荧光背景。 The light source, filters and detectors may also be used to monitor tissue autofluorescence to correct for background autofluorescence. 本申请要求于2013年3月14日提交的、题为“Method and Device for Correcting Optical Signals”的美国临时专利申请61/785,087的权益，该申请在此通过引用整体并入。  This application claims the March 14, 2013 submitted by the US provisional patent entitled "Method and Device for Correcting Optical Signals" Application 61 / 785,087, which is hereby incorporated by reference. 本发明涉及用于监测植入物的方法和装置，并具体地涉及用于校正从植入物发射的发光信号的方法和装置。  The present invention relates to a method and apparatus for monitoring the implant, and in particular relates to a method and apparatus for correcting a light emission signal emitted from an implant. 在某些个体中，对分析物(例如葡萄糖、乳酸盐或氧)水平的监测对于他们的健康是很重要的。  In some individuals, the analyte (eg glucose, lactate, or oxygen) levels for monitoring their health is very important. 高水平或低水平的葡萄糖，或其他分析物，可能有不利影响或预示特定的健康状态。 High or low glucose, or other analytes, may adversely affect or indicate a specific health condition. 葡萄糖的监测对于患有糖尿病的个体特别重要，他们中的一个子集必须确定何时需要胰岛素以降低他们体内的葡萄糖水平或者何时需要额外的葡萄糖以提高他们体内的葡萄糖水平。 Glucose monitoring is particularly important for individuals with diabetes, a subset of them must determine when insulin to lower glucose levels in their bodies or when additional glucose need to improve their glucose levels. 被许多患有糖尿病的个体用来亲自监测他们的血糖水平的常规技术包括定期抽取血液，将该血液施加到测试条，并使用量热、电化学或光度检测法来确定血糖水平。  Many individuals are conventional techniques used person suffering from diabetes monitor their blood glucose levels regularly comprising withdrawing blood, applying the blood to the test strip, and the amount of heat, electrochemical or photometric detection method to determine the blood glucose level. 这种技术不允许连续或自动监测体内的葡萄糖水平，而通常必须在周期性基础上手动执行。 This technique does not allow continuous or automatic monitoring of glucose levels, usually must be performed manually on a periodic basis. 不幸的是，葡萄糖水平的检查的一致性在个体之间变化很大。 Unfortunately, consistency checking glucose levels vary greatly between individuals. 许多糖尿病患者发现定期测试不方便，并且他们有时会忘记测试他们的葡萄糖水平或者没有时间进行适当的测试。 Many people with diabetes find periodic testing inconvenient and they sometimes forget to test their glucose levels or no time for proper testing. 此外， 一些个体希望避免与测试相关联的疼痛。 In addition, some individuals want to avoid the pain associated with the test. 未受监控的葡萄糖可能导致高血糖或低血糖发作。 Unmonitored glucose can lead to high blood sugar or hypoglycemia. 监测个体分析物水平的植入式传感器将允许个体更容易地监测他们的葡萄糖或其他分析物水平。 Monitoring individual implantable analyte level sensor will allow an individual to more easily monitor their glucose or other analyte level. 各种装置已经被开发用于监测血流中或各种组织的间质液中的分析物(例如，葡萄糖）。  Various devices have been developed to monitor the blood stream or in interstitial fluid analyte in a variety of tissues (e.g., glucose). 许多这些装置使用被插入到患者血管中或皮下的传感器。 Many of these devices use the sensor is inserted into a patient's blood vessel or subcutaneously. 因为高散射存在下的低荧光水平，这些植入式传感器通常难以光学地读取或监测，前述高散射归因于皮肤状况的动态变化(例如，血液水平和水合作用）。 Because of the low levels of fluorescence in the presence of high scattering, which is often difficult implanted sensor optically reads or monitoring the dynamic changes due to high scattering of the skin condition (e.g., blood levels and hydration). 皮肤是高度散射的，并且该散射可以主导光传播。 The skin is highly scattering, and the scattering of light propagation can dominate. 散射是由组织中折射率变化所引起的，并且，皮肤中的主要散射组分归于脂质、胶原蛋白和其他生物组分。 Is the refractive index of the scattering caused by a change in tissue, and, mainly attributable to the scattering component of skin lipid, collagen and other biological components. 主要的吸收是由血液、黑色素、水和其他组分所引起的。 The main absorption by blood, melanin, water and other components caused. 一个装置(公开于Yu的已公布美国专利申请20090221891中），包括葡萄糖分析部件。  a means (Yu has been disclosed in U.S. Patent Application Publication 20090221891), the analysis component comprises glucose. 当传感器被植入体内时，通过外部光学器件经皮读出光学信号。 When the sensor is implanted into the body, through the external optical signals of the optical readout device percutaneously. 荧光计，分别对供体发色团和受体发色团测量激发光强度、环境光强度以及发光和环境光的复合强度。 Fluorometer, respectively, of the donor chromophore and the acceptor chromophore excitation light intensity measurement, the ambient light intensity and the intensity of the emission and the compound of ambient light. 通过握持荧光计接近皮肤并对准传感器来进行测量。 By holding the fluorimeter close to the skin and the alignment sensor to measure. 提供的最终输出是来自这两个发色团的发光强度之间的归一化比值，该比值可以使用校准数据被转换为分析物浓度。 The final output provided is the normalized ratio between the emission intensity from the two chromophores, this ratio using the calibration data can be converted into analyte concentration. 校准曲线通过测量响应对葡萄糖浓度而被经验性地建立。 The glucose concentration calibration curve is established empirically by measuring response. 尽管该装置提供了一些光学信号校正，但获得准确读数可能仍然是困难的，这归因于导致从植入物发射的光的光学散射和吸收的动态的皮肤变化。 While this arrangement provides some of the optical signal corrected, but will obtain an accurate reading it may still be difficult, due to cause optical scattering of light emitted from the implant and dynamic changes in the skin absorption. Merritt的美国专利申请20110028806公开了另一种用于测量血糖水平的方法和系统。  Merritt U.S. Patent Application 20110028806 discloses a method and system for measuring blood glucose levels for another of. 一组光电二极管检测从一个或多个发射器(例如多个LED)发射到患者皮肤中的光能量的发光和反射。 A set of photodiodes detecting emission from one or more transmitters (e.g., a plurality of LED) light emission and the reflected light energy to a patient's skin. 结合到葡萄糖的小分子代谢物报道子(reporter) (SMMRs)被引入角质层和表皮的组织以提供更易于检测的发光。 Small molecule bound to a glucose metabolite reporter (reporter) (SMMRs) is introduced into the stratum corneum and epidermis tissue to provide a more readily detectable light emission. 使用在接近激发波长处进行的反射强度测量来校准测试结果。 Using the reflection intensity measurement at a wavelength near the excitation for calibrated test results. 此外，该方法包括测量第二发光和反射强度，以归一化来自第一组测量的数据。 Furthermore, the method comprising measuring a second emission intensity and reflection, to normalize data from the first set of measurements. 第一发光和反射强度测量在使用SMMR处理的部位处进行。 The first emission intensity and reflection measurements at the site of use SMMR process. 第二发光和反射强度测量在未处理的背景部位处进行。 A second emission intensity and reflection measurements at the site of untreated background. 然后使用背景测量通过波长归一化来校正背景组织发光和吸收。 Then background corrected normalized measured background tissue absorption and emission wavelength. 尽管该方法对于背景发光和反射提供了一些光信号校正，但是从表皮中的葡萄糖结合分子获得准确和/或一致的葡萄糖读数可能仍然是困难的。 While this method provides some correction for background luminescence signal light and reflection, but accurate and / or consistent molecule binding glucose readings from the glucose epidermis may still be difficult. 仍然需要这样一种小型的、紧凑的装置，该装置可以准确和一致地监测植入式传感器，并提供信号给分析者，而基本上不限制患者的运动和活动。  still a need for a small, compact apparatus can be accurately and consistently monitor the implanted sensor, and to provide a signal by analysis, but does not essentially restrict patient movement and activity. 当分析物水平处于或接近阈值水平时，分析物的连续和/或自动监测可以对患者提供警告。 When the analyte level is at or near the threshold level, continuous analysis and / or automatic monitoring of the patient may provide a warning thereof. 例如，如果葡萄糖是分析物，那么该监测装置可以被配置成警告患者当前正在发生或即将发生高血糖或低血糖。 For example, if glucose is the analyte, then the monitoring device can be configured to alert the patient is currently taking place, or high blood sugar or low blood sugar is imminent. 那么患者就可以采取适当的行动。 Then the patient can take appropriate action. 根据一个方面，提供一种方法，用于校正从植入物发射的至少一个分析物相关光学信号。  According to one aspect, there is provided a method for the at least one analyte associated optical calibration signal transmitted from the implant. 该植入物通常被埋置在哺乳动物身体的组织中。 The implants are usually embedded in the mammalian body tissues. 该植入物能够响应于激发波长范围内的激发光，发射处于发射波长范围内的分析物相关光学信号。 The implant in response to an excitation wavelength range of the excitation light, the emission of optical signals in the analyte related emission wavelength range. 该方法包括发送激发波长范围内的第一激发光穿过组织到植入物，并且响应于该第一激发光测量从组织发射的发射波长范围内的第一光学信号。 The method includes transmitting a first excitation wavelength range of the excitation light through the tissue to the implant, and the optical signals in response to the first emission wavelength range to the first measurement of the excitation light emitted from the tissue. 该方法还包括发送处于发射波长范围内的第二激发光到组织中，并且响应于该第二激发光测量从组织发射的发射波长范围内的第二光学信号。 The method further comprises transmitting at a second excitation wavelength range of the light emitted into the tissue, and in response to the second excitation light optical measurement signal within the second emission wavelength range emitted from the tissue. 根据所测量的信号计算至少一个校正的信号值。 At least one correction signal value is calculated based on the measured signal. 根据另一个方面，提供一种光学检测装置，用于监测埋置在哺乳动物身体的组织中的植入物。  According to another aspect, there is provided an optical detection means for monitoring the mammalian body embedded in a tissue implant. 该植入物能够响应于激发波长范围内的激发光，发射处于发射波长范围内的至少一个分析物相关光学信号。 The implant in response to an excitation wavelength range of the excitation light, the at least one analyte related emission of the optical signal wavelength range is emitted. 该装置包括第一光源，该第一光源被布置成发送激发波长范围内的第一激发光穿过组织到植入物。 The apparatus includes a first light source, the first light source is arranged to transmit a first excitation wavelength range of the excitation light through the tissue to the implant. 第二光源，被布置成发送处于发射波长范围内的第二激发光到组织中。 A second light source arranged to emit a second excitation is transmitted in the wavelength range of light into the tissue. 至少一个检测器，被布置成响应于第一激发光测量从组织发射的发射波长范围内的第一光学信号，以及被布置成响应于第二激发光测量从组织发射的发射波长范围内的第二光学信号。 At least one detector is disposed a first optical response signal emitted in the wavelength range emitted from the tissue, and is arranged in response to the second excitation light emitted in the wavelength range of measurement emitted from the first excitation light to the tissue measurement second optical signal. 根据另一个方面，提供一种方法，用于校正至少一个从埋置在哺乳动物身体的组织中的植入物发射的分析物相关光学信号。  According to another aspect, there is provided a method for correcting the analyte correlation optical signal transmitted from the at least one buried in the mammalian body tissue implant. 该植入物能够响应于激发波长范围内的激发光，发射处于发射波长范围内的分析物相关光学信号。 The implant in response to an excitation wavelength range of the excitation light, the emission of optical signals in the analyte related emission wavelength range. 该方法包括发送激发波长范围内的第一激发光穿过组织到植入物，并且响应于该第一激发光测量从组织发射的发射波长范围内的第一光学信号。 The method includes transmitting a first excitation wavelength range of the excitation light through the tissue to the implant, and the optical signals in response to the first emission wavelength range to the first measurement of the excitation light emitted from the tissue. 该方法还包括发送激发波长范围内的第二激发光到组织中，并且响应于该第二激发光测量从组织发射的发射波长范围内的第二光学信号。 The method further includes transmitting a second excitation wavelength range of the excitation light into the tissue, and in response to the second optical signal emitted in the wavelength range emitted from the tissue of the second excitation light measurement. 第二激发光和响应于第二激发光发射的光形成光路，该光路从植入物被横向间隔开足够的距离，以避免来自植入物报道子(例如，发光、发光、生物发光或磷光报道子）的显著贡献。 Second excitation light and the light path is formed in response to light emitted from the second excitation light, the optical path is laterally spaced apart a sufficient distance from the implant to prevent the implant from the reporter (e.g., emission, luminescence, phosphorescence or bioluminescence reporter) a significant contribution. 根据所测量的光学信号计算至少一个校正的信号值。 At least one correction signal value is calculated based on the measured optical signal. 根据另一个方面，提供一种光学检测装置，用于监测埋置在哺乳动物身体的组织中的植入物。  According to another aspect, there is provided an optical detection means for monitoring the mammalian body embedded in a tissue implant. 该植入物能够响应于激发波长范围内的激发光，发射处于发射波长范围内的至少一个分析物相关光学信号。 The implant in response to an excitation wavelength range of the excitation light, the at least one analyte related emission of the optical signal wavelength range is emitted. 该装置包括第一光源，该第一光源被布置成发送激发波长范围内的第一激发光穿过组织到植入物。 The apparatus includes a first light source, the first light source is arranged to transmit a first excitation wavelength range of the excitation light through the tissue to the implant. 第一检测器，被布置成响应于第一激发光测量从组织发射的发射波长范围内的第一光学信号。 A first detector, arranged to measure the response to the first excitation light within a first wavelength range emitted optical signal emitted from the tissue. 第二光源，被布置成发送激发波长范围内的第二激发光到组织中。 A second light source is arranged to send a second excitation wavelength range of the excitation light into the tissue. 第二检测器，被布置成响应于第二激发光测量从组织发射的发射波长范围内的第二光。 A second detector arranged to measure the response to the second excitation light emitted of the second light in a wavelength range emitted from the tissue. 第二光源和第二检测器被相对于彼此放置，使得第二激发光和响应于该第二激发光发射的光形成光路，该光路从植入物被横向间隔开足够的距离，以避免来自植入物报道子的显著贡献。 Second light source and the second detector is disposed with respect to one another, such that in response to the second excitation light and second excitation light to the light emitted form an optical path, the optical path from the implant is laterally spaced apart a sufficient distance to prevent from implanting a significant contribution to the reporter substance. 图1示出根据本发明一个实施例的用于监测植入物的光学检测装置的示意性侧视图。  FIG. 1 shows a schematic side view of an optical detection means for monitoring an embodiment of an implant according to the present invention. 图2示出根据本发明另一个实施例的用于监测植入物的光学检测装置的示意性侧视图。  FIG. 2 shows a schematic side view of the optical detection means for monitoring an implant according to another embodiment of the present invention. 图3示出根据本发明另一个实施例的光学检测装置的一些方面的示意性侧视图。  FIG. 3 shows a schematic side view of some aspects of the optical detection apparatus according to another embodiment of the present invention. 图4示出根据本发明另一个实施例的光学检测装置的示意性俯视图。  FIG. 4 shows a schematic view of an optical detection apparatus according to another embodiment of the present invention. 图5示出图4的装置的示意性剖面图。  FIG. 5 shows a schematic cross-sectional view of the apparatus 4. 图6示出根据本发明一些实施例的光学检测装置的示意性侧视图。  FIG. 6 shows a schematic side view of the optical detector device according to some embodiments of the present invention. 图7示出根据本发明一些实施例的光学检测装置的示意性俯视图。  FIG. 7 shows a schematic plan view of some of the optical detection apparatus according to an embodiment of the present invention. 图8示出图7的装置的示意性剖面图。  FIG. 8 shows a schematic cross-sectional view of the device of FIG. 图9示出根据本发明一些实施例的光学检测装置的示意性俯视图。  FIG. 9 shows a schematic plan view of some of the optical detection apparatus according to an embodiment of the present invention. 图10示出图9的装置的示意性剖面图。  FIG. 10 shows a schematic cross-sectional view of the device 9. 图11示出根据本发明一些实施例的光学检测装置的示意性俯视图。  FIG. 11 shows a schematic plan view of some of the optical detection apparatus according to an embodiment of the present invention. 图12示出图11的装置的示意性分解图。  FIG. 12 shows a schematic exploded view of the device 11 of FIG. 在下面的描述中，应当理解，结构之间所有描述的连接可以是直接操作性连接或者是通过中间结构的间接操作性连接。  In the following description, it should be understood that all connections between the described structure may be operatively connected directly or indirectly operatively connected to the intermediate structure. 一组要素包括一个或多个要素。 A set of elements includes one or more elements. 对要素的任何描述应理解为是指至少一个要素。 Any description of the element should be understood to mean at least one element. 多个要素包括至少两个要素。 A plurality of elements comprising at least two elements. 除非另有要求，任何描述的方法步骤不需要一定以特定的所示出顺序执行。 Unless otherwise required, any method step described need not necessarily be performed in the particular order shown. 源自第二要素的第一要素(例如数据)包括等于该第二要素的第一要素，以及通过处理第二要素和任选的其他数据所生成的第一要素。 A first element from the second element (e.g., data) equal to the second element comprises a first element, a first element and generated by the second processing element and optionally other data. 根据参数做出确定或决策包括根据该参数和可选的根据其他数据做出确定或决策。 The determination or decision making parameter based on the parameter and optionally includes a make decisions based on other data or determined. 除非另有规定，一些数量/数据的指标可以是该数量/数据本身，或者不同于该数量/数据本身的指标。 Unless otherwise specified, some quantity / index data may be the number / data itself, or is different from the number of index / data itself. 本发明的一些实施例中描述的计算机程序可以是独立的软件实体或其他计算机程序的子实体(例如，子例程，代码对象）。 Computer programs described in Example embodiments of the present invention may be an independent software entity or fruiting bodies of other computer programs (e.g., subroutines, code objects). 计算机可读介质包括非暂时性介质如磁的、光学的和半导体的存储介质(例如硬盘驱动器，光盘，闪存，DRAM)，以及通信链路，例如导电电缆和光纤链路。 Non-transitory computer readable media include media such as magnetic, optical and semiconductor storage medium (e.g., hard disk drives, optical disk, flash memory, a DRAM), and a communication link, such as conductive cables and optical fiber links. 根据一些实施例，本发明提供(尤其是)计算机系统，该计算机系统包括被编程以执行此处描述的方法的硬件(例如，一个或多个处理器和相关的存储器），以及编码指令以执行此处描述的方法的计算机可读介质。 According to some embodiments, the present invention provides (in particular) a computer system, the computer system comprising hardware programmed to perform the method described herein (e.g., one or more processors and associated memory), and encoding instructions to perform the method described herein is a computer-readable medium. 以下的说明以举例的方式而未必是以限制的方式阐明了本发明的实施例。  The following description by way of example and not necessarily by way of limitation illustrate embodiments of the present invention. 图1示出根据本发明第一实施例的光学检测装置10的示意性侧视图，该光学检测装置10用于监测植入式传感器或植入物12。  FIG. 1 shows a schematic side view of a first embodiment of the optical detection apparatus 10 of the present invention, the optical detecting means 10 for monitoring the implanted sensor 12 or the implant. 植入物12被埋置在哺乳动物身体的组织中（在各种实施例中，其可以是组织的一部分，该部分附接于或不附接于身体的其余部分）。 The implant 12 is embedded in the body tissue of a mammal (In various embodiments, it may be part of the organization, the portion not attached or attached to the rest of the body). 植入物12通常被埋置在皮肤14的表面之下。 The implant 12 is typically buried beneath the surface of the skin 14. 植入物12被埋置在皮肤14的表面之下的第一深度处，该第一深度优选为足够的深度，以将植入物安置在皮下组织中（例如，皮肤14的表面之下1至5mm范围内）。 The implant 12 is embedded in a first depth below the surface of the skin 14, the first depth preferably a depth sufficient to place the implant in the subcutaneous tissue (e.g., below the surface of the skin 14 1 to within the range of 5mm). 在一些实施例中，植入物12被埋置在处于皮肤14的表面之下大于或等于2_的深度处的组织中，并且在其他实施例中，植入物12被埋置在处于皮肤表面之下大于或等于4mm的深度处的组织中。 In some embodiments, the implant 12 is buried beneath the surface of the skin is greater than or equal 14 at a tissue depth of 2_, and in other embodiments, the implant 12 is embedded in the skin is or greater below the surface of the tissue at a depth of 4mm. 植入物12能够响应于激发波长范围内的激发光，发射至少一个发射波长范围内的分析物相关光学信号。  The implant 12 in response to an excitation wavelength range of the excitation light, the at least one analyte related emission of optical signals in a wavelength range of emission. 分析物可以包括，例如，个体体内的葡萄糖或其他分析物。 Analyte may comprise, e.g., an individual in vivo glucose or other analytes. 合适的光学信号包括，但不限于，发光、生物发光、磷光、自发光和漫反射信号。 Suitable optical signals include, but are not limited to, luminescent, bioluminescent, phosphorescent, spontaneous and diffuse signal. 在优选的实施例中，植入物12包含一个或多个发光染料，该发光染料的光发射强度根据个体体内的目标分析物的量或存在而变化。 In a preferred embodiment, the implant 12 comprises one or more luminescent dyes, the light emission intensity of the luminescent dye in accordance with the amount of target analyte in the body of an individual or the presence of changes. 第一光源16被布置为从皮肤14的表面发送激发波长范围内的第一激发光到植入物12。  The first light source 16 is arranged to transmit the excitation from the surface of the skin 14 of a first wavelength range of the excitation light 12 to the implant. 第二光源18被布置为从皮肤14的表面发送第二激发光到组织15中。 The second light source 18 is arranged to transmit the second tissue 15 from the excitation light 14 to the surface of the skin. 第二激发光优选处于分析物相关发光信号的发射波长范围内（例如，发射峰）。 A second emission wavelength range of the excitation light is preferably related to the analyte emission signal (e.g., emission peak). 合适的光源包括，但不限于， 激光，半导体激光，发光二极管(LED)，有机LED。 Suitable light sources include, but are not limited to, a laser, semiconductor laser, light emitting diode (the LED), organic LED. 至少一个检测器，并且更优选至少两个检测器20、22随光源16、18布置。  at least one detector, two detectors and more preferably at least 20, 22, 16, 18 arranged with the light source. 第一检测器20被放置以响应于来自第一光源16的第一激发光来测量在皮肤14的表面处发射的发射波长范围内的第一光学信号（例如，光的强度）。 The first detector 20 is disposed a first optical signal (e.g., light intensity) within a wavelength range to emit light in response to the first measurement from the first excitation light source 16 at the surface of the skin 14 emitted. 检测器20还被布置成响应于第二激发光来测量从组织15发射的穿过皮肤14表面的发射波长范围内的第二光学信号。 Detector 20 is further arranged a second optical signal in response to the second excitation light to measure the wavelength range emitted from the surface of the skin 14 through tissue 15 emitted. 合适的检测器包括，但不限于，光电二极管或CCD。 Suitable detectors include, but are not limited to, a photodiode or a CCD. 尽管对于一些实施例来说多个检测器是优选的，人们也可以使用单个通用检测器。 Although for some embodiments, it is preferred that a plurality of detectors, one can also use a single common detector. 检测器20、22优选经过滤（例如，二向色滤光片或其它合适的滤光片）以测量在相应波长范围内发射的光学信号。 Detector 20, 22 is preferably filtered (e.g., dichroic filter or other suitable filter) to measure the optical signal transmitted in the respective wavelength ranges. 在这个例子中，对葡萄糖浓度敏感的合适发光染料是Alexa 647,Alexa 647响应于约600至650nm范围内（吸收峰647nm)的激发光（吸收），并且发射波长在约670至750nm范围内，具有约680nm的发射峰。 In this example, the glucose concentration-sensitive Suitable luminescent dyes are Alexa 647, Alexa 647 in response to a range of about 600 to 650nm range (absorption peak of 647 nm) of the excitation light (absorption) and emission wavelength in the range from about 670 to 750nm range, with an emission peak of about 680nm. 在装置10的操作中，针对漫反射和/或自身荧光校正从植入物12发射的分析物相关发光信号。  In the operation of apparatus 10, the correction signal is related emission emitted from the implant 12 for analytes diffuse and / or autofluorescence. 光源16被激活以从皮肤14的表面发送激发波长范围内的第一激发光到植入物12。 A first light source 16 is activated to excite excitation from the surface of the skin in the transmission wavelength range of the light 14 to the implant 12. 第一检测器20响应于该第一激发光在皮肤14的表面处测量从组织15发射的处于发射波长范围内的第一光学信号，正如由从光源16到植入物12到第一检测器20的第一光路24所表示的那样。 First detector 20 in response to the first excitation light on the measurement surface of the skin 14 of the first optical signal emitted from the wavelength range emitted in tissue 15, as from the light source 16 to the implant 12 to a first detector the first optical path 20 as indicated by 24. 光路24提供了初级的分析物相关光学信号。 24 provides a primary optical path analyte associated optical signal. 第二光源18被激活以从皮肤14的表面发送第二激发光到位于皮肤14的表面之下的组织15中的第二深度。 The second light source 18 is activated to transmit second excitation light 14 from the surface of the skin to a depth of 15 in the second surface of the tissue beneath the skin 14. 第二激发光基本上处于分析物相关发光信号的发射波长范围内（例如，发射峰）。 Second excitation light emission wavelength range substantially within an analyte related emission signals (e.g., emission peak). 第一检测器20响应于第二激发光测量从组织15发射穿过皮肤14的表面的处于发射波长范围内的第二光学信号，正如由第二光路26所表示的那样。 First detector 20 in response to the second excitation light 15 emitted from the tissue measured through the second optical signal is emitted in the wavelength range of the surface of the skin 14, the second optical path 26 as represented by the above. 第二光学信号可以用作参考信号，以针对组织15中光的漫反射或散射而校正初级的分析物相关光学信号。  The second optical signal can be used as a reference signal, the light 15 to target tissue diffuse reflection or scattering of the primary corrected analyte associated optical signal. 在一些实施例中，在皮肤14表面之下光路26延伸所达的第二深度可以基本上等于植入物12被埋置所处的第一深度(例如，在皮肤14表面之下1至5mm深度处的皮下组织中）。 In some embodiments, the second depth below the surface of skin 14 26 extending optical path of the first implant may be substantially equal to the depth at which the buried object 12 (e.g., 14 below the surface of the skin 1 to 5mm at a depth of subcutaneous tissue). 在一些实施例中，第二光学信号的光路26延伸到大于或等于皮肤14的表面之下2mm的深度，并且在其他实施例中，第二光学信号的光路26延伸到大于或等于皮肤的表面之下4mm的深度。 In some embodiments, the optical path of the second optical signal is greater than or equal to 26 extends 2mm depth below the surface of the skin 14, and in other embodiments, the second optical path 26 extends to the surface of the optical signal is greater than or equal to the skin under the depth of 4mm. 在上面的式子（1)中，项S (LSI，Dl)表示第一光学信号，第一光学信号是从第一光路24测量得到的初级的分析物相关光学信号，该第一光路24从第一光源16到植入物12到第一检测器20。  In the above equation (1), the term S (LSI, Dl) represents the primary analyte associated optical signal the first optical signal, a first optical signal was measured from the first optical path 24, the first a first optical path 24 from the light source 16 to the implant 12 to a first detector 20. 项C (LS2，D1)表示第二光学信号，第二光学信号是从第二光路26测量得到的校正因子信号，该第二光路26从第二光源18到第一检测器20。 Item C (LS2, D1) denotes a second optical signal, the second optical signal is the second signal 26 a correction factor obtained from the measurement optical path, the second optical path 26 from the second light source 18 to a first detector 20. 项C (LSI，D2)表示可选的第三光学信号，第三光学信号是从第三光路28测量得到的附加校正因子信号，该第三光路28从第一光源16到第二检测器22。 Third optical signal term C (LSI, D2) represents an optional, additional third optical signal is the third signal 28 a correction factor obtained from the measurement light path, the third optical path 28 from the first light source 16 to the second detector 22 . 因此，从植入物12发射的初级的分析物相关光学信号可以针对分析物相关光学信号的发射波长范围内的漫反射或散射而被校正，以解决组织15中信号的光学散射或吸收。  Thus, the primary can be corrected analyte correlation optical signal 12 emitted from the implant for the diffusely reflected or scattered within the emission wavelength range of the optical signals related analytes, in order to solve the tissue optical scattering signal 15 or absorb. 分析物相关光学信号可以可选地针对激发波长范围内的散射、反射或衰减而被校正，以解决皮肤属性中的动态变化。 Analyte may optionally be associated optical signal for the excitation wavelength range of scattering, reflection or attenuation is corrected to address the dynamic changes in the skin properties. 通过一个或多个参考信号来校正分析物相关信号的一个优点是:准确和/或一致的葡萄糖值可以从对发射自位于组织中相对较深处（例如在皮下区域中）的植入物的光进行的测量而被确定。 One advantage of the correlation signal to correct the analyte by one or more reference signals are: accuracy and / or consistency from the glucose value for emitted from the tissue is located relatively deep (e.g. subcutaneous area) of the implant the measurement light is determined. 从植入物12发射的光可能被植入物和皮肤14的表面之间的组织15强烈调整。 Light emitted from the implant 12 may be implanted between the tissue 14 and skin surface 15 of a strong adjustment. 除了针对激发光和背景或环境光的校正之外（如果需要的话）， 本发明的实施例提供了针对从组织15发射的光的调整而进行校正的手段。 In addition to correcting for the excitation light and the background or ambient light (if desired), embodiments of the present invention provides a means for correcting and adjusting the light emitted from the tissue 15. 另一个优点在于，用于校正因子(例如漫反射、自身荧光和/或背景光）的参考光学信号的测量是在几秒或更少时间内在与植入物12埋置的组织15相同区域中进行的，这样一来，在测量时间处，动态的皮肤或组织属性(该属性在身体不同区域中可能是变化的）对于校正信号与对于初级的分析物相关信号来说基本上是相同的。  Another advantage is that, for the correction factor (e.g. diffuse reflectance, autofluorescence, and / or background light) of the optical reference signal is measured in a few seconds or less hours at 12 with the implant 15 embedded tissue performed in the same area, so that, at the measurement time, the dynamic properties of the skin or tissue (the attributes in different areas of the body may be changed) for a correction signal related to the primary analyte signal is substantially identical. 在对分析物相关信号、漫反射校正信号和/或自身荧光校正信号执行光学读取之前，可以进行暗读取以解决背景或环境光，并且该读取可以用来进一步校正信号，例如，通过背景减除。 Before the analyte correlation signal, the correction signal and diffuse reflectance / autofluorescence correction signal or performing optical reading, the dark reading may be performed to address the background or ambient light, and can be used to further correct the reading signal, e.g., by background subtraction. 对校正因子的光学读取的优选顺序为背景减除、自身荧光校正和漫反射校正，尽管不需特定顺序。 Preferably the optical correction factor sequence read as the background subtraction, autofluorescence and diffuse reflectance calibration correction, though this is not a particular order. 在一些实施例中，分析物浓度(例如，葡萄糖水平)从校正的信号值而被确定。  In some embodiments, the analyte concentration (e.g., glucose level) is determined from the corrected signal value. 优选地，使用查找表或校准曲线根据校正的信号值来确定分析物浓度。 Preferably, a lookup table or calibration curve to determine the analyte concentration value based on the correction signal. 查找表或校准曲线可以在包含于光学器件的微处理器中。 Lookup table or calibration curve may comprise a microprocessor in the optical device. 在一些实施例中，微处理器被编程以存储所测量的信号值和/或计算校正的信号值。 In some embodiments, the microprocessor is programmed to store a signal value of the signal value of the measured and / or calculated correction. 替代性地，这些功能可以在独立的处理器中或与该光学装置通信的外部计算机中执行。 Alternatively, these functions may be performed with an external computer or the optical communication apparatus in a separate processor. 外部处理器或计算机接收表示所测量的光学信号的数据，并计算校正的信号值和分析物浓度。 Data optical signal the measured external processor or computer receives said signal and calculates the correction value and the analyte concentration. 替代性地，可以提供多个处理器，例如，在与一个或多个外部处理器或计算机通信(无线地或通过电线）的光学装置中提供一个或多个处理器。 Alternatively, multiple processors may be provided, e.g., one or more processors with one or more external processor or computer communication (wireless or by wire) of the optical device. 图2示出用于监测植入物12的光学检测装置30的另一个实施例。 Another  FIG. 2 illustrates an optical detecting means 30 for monitoring the implant 12 embodiment. 在这个实施例中， 植入物12还能够响应于第二激发波长范围（该第二激发波长范围可以共享第一发射波长范围或与之重叠）内的激发光，发射第二发射波长范围内的至少一个分析物不相关光学信号。 In this embodiment, the implant 12 is also in response to the second excitation wavelength range (excitation wavelength of the second emission wavelength range of the first range may share or overlap) in the excitation light emission in the second emission wavelength range at least one analyte not associated optical signal. 植入物12优选含有分析物不相关发光染料，该分析物不相关发光染料用于控制非分析物在报道子染料上的物理或化学作用(例如，光漂白或pH)。 The implant 12 preferably contains a luminescent dye irrelevant analyte, the analyte is not relevant luminescent dyes for controlling physical or chemical action on the non-analyte-reporter dye (e.g., photobleaching, or pH). 多种染料可以使用。 Various dyes may be used. 该分析物不相关光学信号不受组织15中存在的分析物所调整并提供用于归一化、偏移校正或内部校准的数据。 This analysis was not associated optical signal is not provided and adjusted for normalization or shift correction data 15 internal calibration analyte present in tissue. 该分析物不相关信号可以补偿非分析物的影响，该影响是化学的或生理学的（例如，氧、 PH、氧化还原条件)或光学的（例如，水、光吸收/散射化合物、血红蛋白）。 The analyte uncorrelated signals may compensate for the effects of non-analyte, this effect is a chemical or physiological (e.g., oxygen, PH, redox conditions) or optical (e.g., water, light absorbing / scattering compounds, hemoglobin). 替代性地，该分析物不相关信号可以由植入物12中的稳定参考染料所提供。 Alternatively, the analyte may be uncorrelated signal by the reference 12 in the implant provides a stable dye. 合适的稳定参考材料包括，但不限于，镧系元素掺杂的晶体，镧系元素的纳米颗粒，量子点，螯合的镧系元素染料和金属(例如，金或银）纳米颗粒。 Suitable stable reference materials include, but are not limited to, lanthanide-doped crystals, nanoparticles lanthanides, quantum dots, lanthanide chelate dye and a metal (e.g., gold or silver) nanoparticles. 稳定参考染料可以为其他信号提供参考信号（例如，用于确定光漂白）。 Stable reference dye may provide a reference signal to other signals (e.g., for determining the photobleaching). 第二实施例不同于上面描述的第一实施例，在于装置30包括第三光源40用于发送激发光穿过皮肤14的表面到组织15中。  The first embodiment differs from the second embodiment described above, in that a third device 30 comprises a light source 40 for transmitting the excitation light passes through the surface of the skin tissue 14 to 15. 在装置30的操作中，使用三个参考信号来校正从植入物12发射的分析物相关发光信号。 In operation of device 30, to correct the reference signal using three correlation analyte emission signal 12 emitted from the implant. 第一光源32被激活以发送第一激发波长范围内的激发光，从皮肤14的表面，穿过组织15,到植入物12。 The first light source 32 is activated to transmit the excitation light of the first wavelength range excited from the surface of the skin 14, through the tissue 15, to the implant 12. 第一检测器34响应于第一激发光在皮肤14 的表面处测量从组织15发射的第一发射波长范围内的第一光学信号，正如由第一光路42所表不的，该第一光路42从第一光源32到植入物12且到第一检测器34。 A first optical detector 34 in response to a first signal within a first wavelength range of the excitation light emitted in a first measuring surface 15 of the skin 14 emitted from the tissue, as the first table 42 is not the optical path, the first optical path 42 from the first light source 32 to the implant 12 and to a first detector 34. 该第一光学信号是初级分析物相关光学信号。 The first optical signal is an optical signal related to the primary analyte. 第二光源38被激活以从皮肤14的表面发送第二激发光到组织15中的第二深度。  The second light source 38 is activated to transmit second excitation light 14 from the surface of the skin tissue to a depth of 15 in the second. 该第二激发光优选处于初级分析物相关光学信号的第一发射波长范围内（例如，发射峰）。 A first emission wavelength range of the second excitation light is preferably in the initial analyte associated optical signals (e.g., emission peak). 第一检测器34响应于第二激发光在皮肤14的表面处测量从组织15发射的发射波长范围内的第二光学信号，正如由第二光路44所表示的那样。 The first detector 34 response to the second excitation light optical measurement signal within the second emission wavelength range emitted from the tissue 15 at the surface of the skin 14, as indicated by the second optical path 44 as indicated. 第二光学信号可以被用来校正植入物12 和皮肤14的表面之间的组织15中光的漫反射或散射。 The second optical signal may be used to correct the implanted tissue diffusely reflected or scattered between the surface 12 and the skin 14, 15 of light. 在一些实施例中，第二光路44的深度可以基本上等于植入物12被埋置所处的第一深度(优选在皮肤14的表面之下1至5mm的皮下组织中）。 In some embodiments, the depth of the second optical path 44 may be substantially equal to the implant 12 which is embedded a first depth (below the surface of the skin 14 is preferably 1 to 5mm subcutaneous tissue). 在一些实施例中，第二光学信号的光路44延伸到大于或等于皮肤14的表面之下2mm的深度，并且在其他实施例中，第二光学信号的光路44延伸到大于或等于皮肤的表面之下4mm的深度。 In some embodiments, the second optical signal optical path 44 extends to a depth greater than or equal to 2mm below the surface of the skin 14, and in other embodiments, the second optical path 44 extends to the surface of the optical signal is greater than or equal to the skin under the depth of 4mm. 在上面的式子(2)中，项S (LSI，Dl)表示第一光学信号，第一光学信号是从第一光路42测量得到的初级分析物相关信号，该第一光路42从第一光源32到植入物12到第一检测器34。  In the above formula (2), the term S (LSI, Dl) indicates a first optical signal, a first optical signal is measured from the first optical path 42 resulting primary analyte related signals, the first optical path 42 from the first light source 32 to the implant 12 to a first detector 34. 项C (LS2，D1)表示第二光学信号，第二光学信号是从第二光路44测量得到的校正因子信号，该第二光路44从第二光源38到第一检测器34。 Item C (LS2, D1) denotes a second optical signal, the second optical signal is a second signal 44 a correction factor obtained from the measurement optical path, the second optical path 44 from the second light source 38 to a first detector 34. 项S (LS2，D2)表示第三光学信号，第三光学信号是从第三光路46测量得到的分析物不相关信号，该第三光路46从第二光源38延伸到植入物12到第二检测器36。 Item S (LS2, D2) a third optical signal, the third optical signal is derived from the third measurement optical path 46 is not related to the analyte signal, the third optical path 46 extending from the second light source 38 to the implant 12 to the second second detector 36. 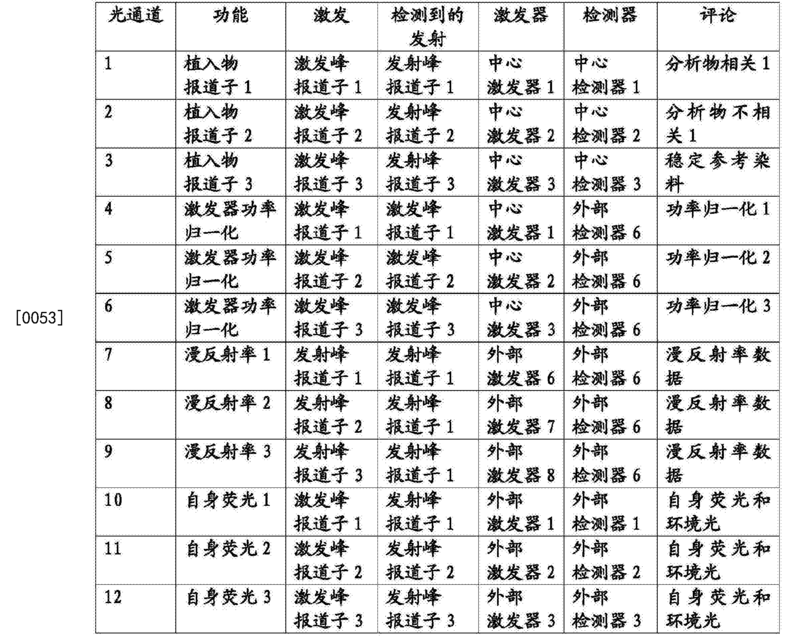 项C (LS3，D2)表示第四光学信号，第四光学信号是从第四光路48测量得到的校正因子信号，该第四光路48从第三光源40延伸到第二检测器36。 Item C (LS3, D2) a fourth optical signal, the fourth optical signal, the fourth optical path 48 extending in a fourth light path correction factor signal 48 measured from the light source 40 from the third to the second detector 36. 在一些实施例中，其中利用两个植入物报道子(例如，发光染料），下面这样是可能的，即植入物报道子的激发(吸收)或发射波长范围可以共享或者重叠。  In some embodiments, the use of two implants in which the reporter (e.g., luminescent dyes), so the following is possible that the promoter reporter was implanted excitation (absorption) or emission wavelength range may overlap or share . 例如，在图2的实施例中，第一染料(其提供分析物相关发光信号）的发射波长范围与第二染料(其提供分析物不相关发光信号）的激发波长范围共享或重叠。 For example, in the embodiment of FIG. 2, a first dye (which provides an analyte related emission signal) and a second emission wavelength range of dyes (which provides an analyte uncorrelated signal emission) of shared or overlapping excitation wavelength range. 在另一个实施例中，第一染料和第二染料可以共享或重叠激发波长范围（这样就可以使用共同的光源），并发射不同发射波长范围内的光学信号。 In another embodiment, the first dye and the second dye may share or overlap the excitation wavelength range (so you can use a common light source) and transmits the optical signals transmitted in different wavelength ranges. 在另一个实施例中，第一染料和第二染料可以由不同激发波长范围内的光所激发并发射相同或重叠的一个或多个发射波长范围的光学信号。 Embodiment, the first dye and the second dye may be excited by light of the optical signal and emitting the same or overlapping one or more different emission wavelength ranges by the excitation wavelength range in another embodiment. 图3示出相对于皮肤14的表面之下植入物12的第一深度Dl的组织15中不同深度D2、D3、D4处的光学询问（interrogation)。  FIG. 3 shows the skin below the surface 14 with respect to the optical interrogation of the implanted tissue was first depth Dl 12, 15 at different depths D2, D3, D4 at (interrogation). 检测器52、54、56的布置与光源50之间的间距Sl、 S2、S3确定相应光路的深度02、03、04。 Detector spacing Sl is disposed between the light source 52, 54, 50, S2, S3 to determine the depth of the corresponding optical paths 02,03,04. 在一些实施例中，对光学信号校正的读取在多个深度处执行，正如由相应的光路所表示的那样，并且，用于校正的参考光学信号的测量值被平均用于校正因子。 In some embodiments, the optical reading signal correction is performed at a plurality of depths, as indicated by the respective light path as indicated, and the measured value of the optical reference signal for correction is averaged correction factors. 在一些实施例中，参考光学信号的光路延伸到组织15中的深度D2,该深度D2 大于植入物12被埋置所处的深度D1。 In some embodiments, the optical path of the optical reference signals 15 extends into the tissue depth D2, D2 is greater than the depth of the implant 12 in which is embedded a depth D1. 参考光学信号的光路也可以延伸到组织15中的深度D3,使得该光路穿过植入物12。 The optical path of the reference light signal 15 may also extend into the depth D3 of the tissue, such that the optical path through the implant 12. 当光学装置具有光源和检测器之间间距的多种可能组合时（如图3-9所示），实现方式可以更灵活，因为植入物12的深度可以是应用特定的。  When the optical device having a plurality of spacing between the light source and detector possible combinations (see Figure 3-9), implementations may be more flexible, since the depth of the implant 12 may be application specific. 在一个实施例中，至少一个分析物不相关信号（其可以由稳定参考染料发射)被用于确定一条或多条光路和所得的一个或多个光学信号的适当深度，该一个或多个光学信号被测量以针对漫反射和/或自身荧光来校正分析物相关信号。 In one embodiment, the at least one analyte uncorrelated signal (refer to a dye which may be stabilized by the transmitter) is used to determine the appropriate depth of the one or more one or more optical signals and the resulting optical paths of the one or more optical signal is measured to be corrected for the diffuse and / or analyte autofluorescence correlation signal. 优选地，使用查找表基于从植入物发射的分析物不相关发光信号的所测量的强度，来确定应当使用归一化光学信号的哪一个或多个可能的深度，或者更具体地，哪一对或多对光源/检测器配对。 Preferably, a lookup table based on the measured intensity uncorrelated emission signals emitted from the analytes implant should be used to determine which of the one or more possible depth normalized optical signal, or more specifically, which one or more pairs of source / detector. 查找表可以是在包含于光学器件的微处理器中，或者是在独立的处理器中或与该光学装置通信的外部计算机中，其接收表示所测量的光学信号的数据(例如，在所选波长内测量的光的强度）。 The lookup table may be contained in a microprocessor in the optical device, or an external computer or the optical communication apparatus, the data receiving an optical signal indicative of the measured in a separate processor (e.g., selected measuring the intensity of the light in the wavelength). 在一些实施例中，处理器被编程为确定(例如，通过计算或查找表)被分配给一个或多个漫反射信号的测量结果的量或权重。  In some embodiments, the processor is programmed to determine (e.g., by calculation or lookup table) is allocated to the one or more measurement signals reflected diffusely amount or weight. 被分配给所测量的漫反射信号的量或权重然后可以被用于校正或归一化一个或多个植入物报道子信号（例如，从植入物发射的初级分析物相关信号），以计算校正的信号值。 Amount or rights being assigned to the measured signals diffusely reflected weights may then be used to correct or normalize the one or more implants reporter signal (e.g., transmitted from the primary implant analyte related signal) of the order calculating corrected signal value. 该量或权重优选根据分析物不相关光学信号(例如，来自稳定参考染料）的强度而被确定。 The amount or weight is preferably not associated optical signals (e.g., from a stable reference dye) was determined according to the intensity of the analyte. 分析物不相关光学信号的强度可以随植入物在组织中的深度而变化。 An optical signal intensity is not relevant analytes can vary with the depth of implantation was tissue. 例如，如果植入物被埋置在皮肤的表面之下2mm的深度处的组织中，在组织中光衰减的量将可能小于如果该植入物被埋置在4mm深度处。 For example, if the implant is embedded in the tissue at a depth of 2mm below the surface of the skin, the amount of light attenuation in the tissue will be less than if the depth of the implant is embedded in 4mm. 比起从埋置于较大深度处的植入物发射的那些信号，从较浅的植入物发射的报道子光学信号可能需要较小的针对漫反射和/或自身荧光的校正因子。 Signals than those disposed at a greater depth from the buried implant emitted, the reporter of the optical signal transmitted from the shallow implant may be required for less diffuse and / or autofluorescence correction factor. 在一些实施例中，用于校正或归一化分析物相关光学信号的漫反射校正因子与深度成正比，并且，根据分析物不相关信号的测量结果来确定被分配给漫反射测量结果的量或权重。 In some embodiments, the correction for diffuse reflectance or normalized correction factor is proportional to the depth of an optical signal related to the analyte, and the measurement is not related to the signal to determine the amount to be allocated to the diffuse reflectance measurements analyte or weight. 图4示出光学装置60的另一个实施例，在该实施例中，光学装置60具有附加光源和检测器，光源和检测器之间的间距有多种可能的组合。 Another  FIG 4 illustrates an embodiment of the optical device 60, in this embodiment, the optical device 60 having an additional light source and detector, the distance between the light source and the detector has a variety of possible combinations. 光源和检测器被布置在适于放置在皮肤表面上的传感器贴片62中，下面更详细地描述光源和检测器。 Light source and detector are disposed on a surface adapted for placement on the skin of the patch sensor 62, the light source and detector is described below in more detail. 至少一个，并且更优选三个中心激发器光源64A、64B和64C被放置以通过贴片62中的中心通路66发送激发光。 At least one, and more preferably three central excitation light source 64A, 64B, and 64C are placed in the center of the patch 62 through the passageway 66 transmits the excitation light. 中心通路66可以包含一个或多个光波导。 Central passageway 66 may comprise one or more optical waveguides. 至少一个检测器，并且更优选由三个中心检测器68A、68B 和68C组成的内环围绕中心通路66布置。 At least one detector, and more preferably central three detectors 68A, 68B and 68C of the inner ring around the central passageway composition 66 is disposed. 同样优选的是，具有多个外环激发器光源和外环检测器(在这个例子中为25个外环光源和检测器)的外环70基本上呈环形图案布置，提供可能的光通道的多种排列。 It is also preferred that the excitation light source having a plurality of outer ring and the outer ring detector (in this example, the outer ring 25 as a light source and detector) is substantially annular outer ring 70 arranged in a pattern, the light tunnel may be provided various arrangements. 激发光源和检测带的组合是光通道。 Excitation source and detector with a combination of the light path. 光学装置60的一个可能的实现方式的例子现在将参考图4-11和表1给出，该例子描述了12条光通道。 An example of a possible implementation of the optical device 60 will now be made with reference to FIGS. 4-11 and are given in Table 1, this example describes the 12 optical channels. 如表1所示，光通道1-3用以测量来自植入物的三个报道子染料信号，包括分析物特异性信号、分析物不相关信号和稳定参考染料信号。  As shown in Table 1, three light channels 1-3 for measuring the reporter dye signal from the implant, including analyte-specific signal, a signal related to the analyte and not stable reference dye signal. 光通道1用以测量来自植入物的分析物特异性发光信号，例如强度随葡萄糖水平变化的光信号。 An optical path for measuring analyte-specific luminescent signal from the implant, for example an optical signal with intensity varying levels of glucose. 其他实施例可以包括来自植入物的多个分析物相关信号。 Other embodiments may include a plurality of analytes from a signal related to the implant. 光通道2用以测量分析物不相关对照，该分析物不相关对照针对报道子染料上的非分析物物理或化学作用（例如，光漂白，pH)。 Optical path 2 for measuring an analyte irrelevant control, the control analyte is not relevant for non-analyte on the physical or chemical action of the reporter dye (e.g., photobleaching, pH). 光通道3用以测量稳定参考染料(例如，镧系元素）。 3 for measuring optical path stable reference dye (e.g., lanthanide). 如列于表1和示于图4,各光通道1-3包括一个相应配对，配对为三个中心激发器光源64A、64B和64C中的一个与三个中心检测器68A、68B和68C中对应的一个。  As shown in Table 1 and shown in Figure 4, each of the light channels comprises a respective pair 1-3, the central three pairs of the excitation light source 64A, 64B and 64C in a center of the three detectors 68A, 68B 68C and a corresponding. 图6示出了植入物报道子的光学检测的光路的示意性侧视图。 Figure 6 shows a schematic side view of the optical path of the optical detection of the reporter implant. 激发光通过中心通路66 (其优选包括单片波导)被发送，从皮肤14的表面，穿过组织15，并且到植入物12。 Excitation light is transmitted through the central passageway 66 (which preferably comprises a monolithic waveguide), from the surface of the skin 14, through tissue 15 and 12 to the implant. 中心检测器68A、68B和68C响应于激发光在皮肤14的表面处测量从组织15发射的相应发射波长范围内的光学信号。 Center of the detector 68A, 68B, and 68C in response to the optical signal within a respective excitation wavelength range of light emission at the measurement surface 15 of the skin 14 emitted from the tissue. 用于分析物相关信号的合适染料是Alexa 647，染料Alexa 647响应于约600至650nm的激发波长范围（激发峰647nm)内的激发光，并且在约670至750nm的发射波长范围内，发射峰约为680nm。 Suitable dyes  analyte related signals to the Alexa 647, the excitation light in the excitation wavelength range (647 nm peak excitation) dyes Alexa 647 in response to the about 600 to 650nm, and the emission wavelength range of about 670 to 750nm in emission peak of about 680nm. 用于分析物不相关信号的合适染料是Alexa 750,染料Alexa 750响应于约700至760nm的激发波长范围（激发峰750nm)内的激发光，并且在约770至850nm的发射波长范围内，发射峰约为780nm。 Suitable dyes for the analyte is uncorrelated signal Alexa 750, Alexa 750 dye in response to an excitation wavelength range of about 700 to 760nm (excitation peak of 750 nm) of the excitation light and emitted in the wavelength range from about 770 to 850nm, the emission peak of about 780nm. 合适的稳定参考染料是铒，铒具有约650至670nm的第一激发光波长范围（激发峰约650nm)，约800至815nm的第二激发波长范围（约805nm的激发峰），以及约980至1050nm的发射波长范围（约1020nm的发射峰）。 Suitable dyes are stable reference erbium, erbium having a first excitation light from about 650 to 670nm wavelength range (excitation peak at about 650nm), from about 800 to 815nm second excitation wavelength range (excitation peak at about 805nm), and from about 980 to 1050nm wavelength range of emission (the emission peak at about 1020nm). 在另一个实施例中，铒和Alexa 647可以从相同光源被激发，其优点在于，多个光源之间功率归一化的可选步骤被减少或被消除。 In another embodiment, erbium and Alexa 647 can be excited from the same source, it is advantageous in that power normalization optional step between a plurality of light sources is reduced or eliminated. 再次参照表1，光通道4-6提供激发器功率归一化信号，这在使用多于一个光源的实施例中是优选的。  Referring again to Table 1, an excitation optical path 4-6 provides the normalized signal power, which is more than one light source embodiment is preferred in use. 激发器功率归一化信号被用于对由各光源输出的激发光的功率的差异进行归一化，其中，各光源的输出功率可能略有不同。 Power excitation signal is normalized for differences in power of the excitation light source of each of the normalized output, wherein the output power of each light source may be slightly different. 如图4-5所示，从中心通路66传播到外环70的激发光的衰减被测量，减少或消除由植入物12的报道子(例如，荧光团）的贡献。 As shown in Figure 4-5, the central passageway 66 is measured attenuation of the excitation light is propagated to the outer ring 70 from the reduction or elimination of the contribution from the reporter (e.g., fluorophore) implant 12. 光通道4-6包括配对的组合，配对为三个中心激发器光源64A、64B和64C以及外环检测器6的配对。 4-6 comprises a combination of light channel pair, the central pair of three excitation light source 64A, 64B and 64C and the outer pair detector 6. 替代性地，可以使用多个检测器来检测激发器功率归一化信号的强度，优选外环检测器。 Alternatively, a plurality of detectors may be used to detect a trigger signal power strength is normalized, preferably the outer ring detector. 对于激发器功率归一化信号，植入物报道子的激发波长范围内的激发光被发送到组织15中。 Excitation the excitation wavelength range of the excitation is normalized signal power, the reporter of the implant light is transmitted into the tissue 15. 从组织15发射的激发波长范围内的光学信号通过检测器6而被检测。 The optical signal from the excitation wavelength range emitted tissue 15 is detected by the detector 6. 植入物报道子的校正的信号值可以针对相应光源的激发器功率而被归一化，例如，通过将对报道子所测量的光学信号除以激发波长范围内的激发光的所测量的强度。 Reporter signal value correction of the implant material may be normalized to a respective power source trigger, e.g., by the optical signal reporter will be measured are divided by the measured excitation light in the wavelength range of the excitation intensity . 光学通道7-9 (表1)提供漫反射测量结果以校正来自植入物的发光染料报道子信号。  The optical channels 7-9 (Table 1) provides diffuse reflectance measurement to correct the signal from the reporter dye emission implant. 如图7-8所示，外部检测器6测量由组织15所造成的光学信号的衰减，该光学信号处于植入物12的发光报道子染料的发射波长范围内。 As shown, the external detector 6 measures the attenuation of the optical signal caused by tissue 15, the optical signal is emitted in the wavelength range of the implant 12 reporter dye emission 7-8. 光通道7-9包括外部激发器光源71A、71B和71C中的三个，它们被布置在外环70中，在这个例子中，它们中的每一个与检测器6配对，并且优选地被放置成提供各光源/检测器组合之间的一系列距离，从而对植入物12的各发光报道子染料计算漫反射校正值。 7-9 comprises an external excitation light tunnel light source 71A, 71C and 71B of three, which are arranged in the outer ring 70, in this example, in which the detector 6 of each pair, and is preferably placed to provide a range of distance between the light source / detector combination, so that each reporter dye emission calculation 12 implants diffuse reflection correction. 在替代性实施例中，可以使用多个检测器而不是利用检测器6来测量所有三个光学信号。 In an alternative embodiment, a plurality of detectors may be used instead of using the detector 6 to measure all three optical signals. 光通道10-12(表1)提供自身荧光和环境光的测量，以校正来自植入物的发光染料报道子信号。  The optical path 10-12 provides autofluorescence and the measured ambient light to correct the signal from the reporter dye emission implant (Table 1). 如图9-10所示，光通道10-12包括布置在外环70中的外部激发器光源和外环检测器的三个配对73A、73B和73C。 As shown, the optical path 10-129-10 comprises three outer ring disposed outside the excitation light source and the outer ring 70 of the detector pairs 73A, 73B and 73C. 外部激发器光源和外部检测器的三个配对73A、73B和73C提供了植入物12的三个报道子发光染料的相同激发和发射光谱，并且位于外环70上远离植入物12。 Three external excitation light source and an external detector pairs 73A, 73B and 73C provided three reporters implant 12 emitting the same excitation and emission spectra of the dye, and on the outer ring 70 is located away from the implant 12. 具体地，用于一个或多个自身荧光测量的每一个外部激发器光源/检测器配对相对于彼此而被放置，使得激发光和响应于该激发光发射的光形成光路78，光路78从植入物12被横向间隔开足够的距离，以避免来自植入物荧光团的显著贡献。 In particular, one or more for each measured autofluorescence external excitation light source / detector pairs are disposed relative to each other, such that the excitation light to the excitation light in response to light emitted form an optical path 78, the optical path from the plant 78 the material 12 is laterally spaced apart a sufficient distance to avoid significant contribution from the implant fluorophore. 优选横向间隔S4大于或等于0.25cm，更优选大于0.5cm，并且最优选大于lcm。  preferably greater than or equal to the lateral spacing S4 0.25cm, and more preferably greater than 0.5cm, and most preferably greater than lcm. 还优选光路78的深度延伸约l-5mm到皮肤14的表面之下的组织15中。 Also preferably the depth of the light path 78 extending from about l-5mm to the tissue below the surface 15 of the skin 14. 当使用多个配对时，各光路可以具有基本上相同的深度或不同的深度，并且所测量的自身荧光光学信号的强度可以被平均以获得校正因子。 When a plurality of pairs, each of the optical paths may have substantially the same depth or different depths, and the fluorescent intensity of the optical signal itself may be measured to obtain the average correction factor. 优选来自一个或多个植入物报道子(例如，荧光团）的、对自身荧光测量的贡献小于所测量的强度的30%，更优选小于20%，最优选小于10%。 Preferably from one or more implants reporter (e.g., fluorophore), the contribution of autofluorescence measurements of less than 30% of the measured intensity, and more preferably less than 20%, most preferably less than 10%. 图11示出传感器贴片62的俯视图，该传感器贴片62具有用于激发光的中心通路66。  FIG. 11 shows a top view of a patch sensor 62, the sensor patch 62 has a central passage 66 for the excitation light. 贴片62的优选尺寸可以是，例如，约16mm的直径和约1.6mm的厚度T。 The preferred size of the patch 62 may be, for example, a diameter of about 16mm thickness of about 1.6mm of the T. 图12示出了贴片62 的示意性分解图，该贴片62包括堆叠的多个层。 FIG 12 shows a schematic exploded view of a patch 62, the patch 62 comprises a plurality of layers stacked. 在一些实施例中，层可以包括具有约200um 优选厚度的塑料盖80、具有约IOOum优选厚度的光控制膜82、具有约200um优选厚度的滤光片84、具有约IOOum优选厚度的另一个光控制膜86、具有约200um优选厚度的硅层88、具有约400um优选厚度的印刷电路板(PCB) 90、具有约300um优选厚度的电池92和具有约200um厚度的壳体9LPCB 90可以包括微处理器，该微处理器被编程为存储所测量的值和/或如前面所述计算校正的信号值。 In some embodiments, the layer may preferably comprise a plastic having a thickness of about 200um cover 80, a light control film having a thickness of about 82 IOOum preferably, a filter having a preferred thickness of about 200um 84, preferably having a thickness of about IOOum another optical control film 86 having a preferred thickness of about 200um silicon layer 88 having a preferred thickness of about 400um printed circuit board (PCB) 90, a battery having a preferred thickness of about 300um and a housing 92 having a thickness of about 200um 9LPCB 90 may include a microprocessor , a microprocessor which is programmed values ​​and / or correction as described previously calculated values ​​stored in the measured signal. 光控制膜是透镜阵列，该透镜阵列在其背侧上具有孔阵列。 The light control film is a lens array, the lens array having an array of holes on its back side. 本领域技术人员应当清楚，所描述发明的实施例可以包括有线或无线手持式阅读器、无线皮肤贴片阅读器、台上仪器、成像系统、手持式装置(例如，手机或移动通信装置）、 智能电话附件和应用程序，或者利用所公开的光学器件和算法的任何其他配置。  skilled in the art will appreciate that the described embodiments of the invention may include a wired or wireless handheld reader, wireless reader dermal patch, the stage apparatus, an imaging system, a handheld device (e.g., a mobile phone or a mobile communication means), a smart phone accessory and application, or by any other configuration of the optical device and the algorithms disclosed. 组织的光学异质性在某些情况下可能是显著的。 Optical heterogeneity  In some cases tissue may be significant. 因此，利用单个光源和单个检测器以确保每一种颜色通过相同光路(该光路穿过组织)可以是有利的。 Thus, using a single light source and a single detector to ensure that each color may be advantageous over the same optical path (the optical path through the tissue). 在一个实施例中，光源可以被安放一组可移动滤光片，该滤光片处于光源和皮肤的表面之间。 In one embodiment, the light source may be placed a set of movable filter that is between the light source and the surface of the skin. 同样，可以利用单个光检测器代替分开的、离散的检测器元件。 Similarly, a single photodetector may be utilized in place of separate, discrete detector elements. 通过使用可移动或可更换的滤光片以允许测量多个波长，检测器可以被用来检测不同颜色。 By using a removable or replaceable filter to permit measurement of a plurality of wavelengths, the detector may be used to detect different colors. 更换或移动滤光片可以由控制转盘、滤光带或其他手段的机械致动器来实现。 Filter may replace or move the control wheel, belt filter, or other means of mechanical actuators to achieve. 替代性地，光学滤光片可以涂有一种材料，当经受电流、 电势、温度或其他可控的影响时，该材料将改变光学滤光特性，使得单个光检测器可用来检测多种颜色。 Alternatively, the optical filter may be coated with a material that, when subjected to a current, potential, temperature, or other controllable effects, alter the material properties of the optical filter, so that a single optical detector used to detect a plurality of colors. 本领域技术人员应当清楚，上述实施例可以以多种方式改变而不脱离本发明的范围。  skilled in the art will appreciate that the above-described embodiments may be changed without departing from the scope of the embodiments of the present invention in various ways. 例如，一个或多个光源、一个或多个检测器、滤光片和/或连接光学部件的光纤的多种不同的排列或布置可以用于实现本发明的装置和方法。 For example, a variety of different arrangements or arrangement of one or more light sources, the one or more detectors, filters and / or optical components of the optical fiber connector may be used to implement the apparatus and method of the present invention. 例如，在一些实施例中，光源和检测器被连同光纤或电缆布置，以发送激发光到皮肤中并测量从皮肤发射的光学信号，而不必须在直接在个体的皮肤上放置光源和检测器。 For example, in some embodiments, the light source and detector together with the fiber or cable is arranged to transmit the excitation light to the optical signal emitted from the skin and measure the skin, without having to be placed directly on the skin of an individual light source and the detector . 在替代性实施例中，装置的尺寸和/或波长范围的目前的优选值可能不同。 In an alternative embodiment, the size of the device and / or the value of the presently preferred wavelength range may be different. 因此，本发明的范围应当由随后的权利要求及其合法等同物来确定。 Accordingly, the scope of the invention should be determined by the following claims and their legal equivalents. 1. 一种用于校正从埋置在哺乳动物身体的组织中的植入物发射的分析物相关光学信号的方法，所述植入物被配置成响应于接收到激发波长范围内的激发信号，发射处于发射波长范围内的分析物相关光学信号，所述方法包括： a) 从光学装置发送所述激发波长范围内的第一生成光穿过所述组织到所述植入物； b) 响应于所述第一生成光，测量从所述组织发射的所述发射波长范围内的第一光学信号； c) 从所述光学装置发送第二生成光到所述组织中，所述第二生成光在所述发射波长范围内； d) 响应于所述第二生成光，测量从所述组织发射的所述发射波长范围内的第二光学信号;和e) 根据所述第一光学信号和所述第二光学信号计算校正的信号值。 1. A method of correcting an analyte associated optical signal transmitted from the body buried in mammalian tissue for implant, the implant is configured to respond to the received excitation signal to the excitation wavelength range , the analyte is associated optical emission signal emitted wavelength range, said method comprising: a) the excitation of the implant into the tissue through the first light generated in the wavelength range from the optical transmitting apparatus; b) generating in response to the first light emitted from the measured tissue transmitted optical signal within a first wavelength range; c) transmitting from the second optical device generating light into the tissue, the second generating light emission in the wavelength range; D) in response to said second generating light, emitted from the measurement of the second optical signal transmitting tissue in the wavelength range; and e) based on said first optical signal said second optical signal and the correction value calculation. 2. 根据权利要求1所述的方法，其中所述第二光学信号行进延伸到所述组织中的深度基本上等于所述植入物被埋置处的深度的光路。 2. The method according to claim 1, wherein said second optical signal travels to extend the depth of the tissue substantially equal to the depth of the optical path thereof is embedded at the implant. 3. 根据权利要求2所述的方法，其中所述植入物被埋置处的所述深度为皮肤的表面之下Imm至5mm的范围内。 3. The method according to claim 2, wherein the implant is buried at a depth below the surface of the skin is in the range of Imm to 5mm. 4. 根据权利要求1所述的方法，其中所述第二光学信号行进延伸到所述组织中的深度大于所述植入物被埋置处的深度的光路。 4. The method according to claim 1, wherein said second optical signal travels extends to a depth greater than the depth of the tissue in the optical path of the implant are embedded at. 5. 根据权利要求1所述的方法，其中所述第一生成光、所述植入物和所述第一光学信号共同限定第一光路的至少一部分，所述方法还包括： a) 从所述光学装置向所述组织中发送在所述激发波长范围内的第三生成光；以及b) 响应于所述第三生成光，测量从所述组织发射的所述发射波长范围内的第三光学信号，所述第三生成光和所述第三光学信号共同限定第二光路的至少一部分，所述第二光路的至少一部分与所述第一光路的相应部分横向间隔开，所述校正的信号值还根据所述第三光学信号来计算。 At least part of the method of claim 5. A method according to claim 1, wherein said first generating light, said first implant and said optical signals collectively define a first optical path further comprises: a) from the said optical transmitting means to the tissue in the third generating excitation light in a wavelength range; a and b) in response to said third generating light, emitted from the tissue measured emission wavelength within a third range the optical signal, said third light generating said third optical signals collectively defining at least a portion of the second optical path, a corresponding portion of the first optical path at least a portion of said second optical path laterally spaced apart, said corrected signal value is also calculated based on the third optical signal. 6. 根据权利要求1所述的方法，其中： 所述植入物被埋置在皮下组织中，并且所述第二生成光行进延伸到所述组织中的深度大于或等于皮肤的表面之下2mm的光路。 6. The method according to claim 1, wherein: the implant is embedded in the subcutaneous tissue, and the second generating light travels extend below the depth of the tissue is equal to or greater than the surface of the skin 2mm optical path. 7. 根据权利要求1所述的方法，其中所述植入物埋置在所述组织中的第一深度处，并且所述第二光学信号行进延伸到所述组织中第二深度的光路，所述方法还包括： a) 从所述光学装置发送第三生成光到所述组织中使得所述第三生成光行进延伸到所述组织中第三深度的光路;和b) 测量从所述组织发射的第三光学信号，所述第三光学信号行进延伸到所述组织中第三深度的光路，所述第三深度不同于所述第一深度以及所述第二深度，所述校正的信号值还根据所述第三光学信号来计算。 7. The method according to claim 1, wherein the first implant was buried at a depth in the tissue, and the second optical signal travels extends to a second depth in the optical path of the tissue, the method further comprising: a) such that said third generating means from the optical transmission of light into the tissue to generate a third light travels an optical path extends to a third depth of the tissue; and b) measuring from the organize a third optical signal transmission, the third optical signal travels tissue extending into the optical path of the third depth, the third depth is different from the first depth and the second depth, said corrected signal value is also calculated based on the third optical signal. 8. 根据权利要求1所述的方法，其中： 所述激发波长范围是第一激发波长范围； 所述植入物被埋置在所述组织中第一深度处;并且所述第二光学信号行进延伸到所述组织中第二深度的光路，所述方法还包括： 从所述光学装置发送第二激发波长范围内的第三生成光穿过所述组织到所述植入物； 测量从所述组织发射的分析物不相关光学信号，根据所述分析物不相关光学信号来确定所述第一深度。 8. The method according to claim 1, wherein: said excitation wavelength range is a first excitation wavelength range; the implant is embedded in the tissue at a first depth; and said second optical signal travels the light path extending to a second depth in the tissue, said method further comprising: generating a third from the second excitation wavelength range of the optical device transmits light through the tissue to the implant; measured from the the tissue analyte emission not associated optical signal, the optical signal is uncorrelated to the first depth is determined according to the analyte. 9. 根据权利要求1所述的方法，其中至少基于从所述植入物发射的分析物不相关光学信号向所述第二光学信号分配量或权重来计算所述校正的信号值。 9. The method according to claim 1, wherein the analyte based at least on the implant emitted from the optical signal uncorrelated weight calculating corrected signal value of the second optical signal to the amount or distribution rights. 10. 根据权利要求1所述的方法，其中所述激发波长范围是第一激发波长范围，所述发射范围是第一发射范围，并且所述植入物被配置成响应于接收到第二激发波长范围内的激发信号，发射具有第二发射范围的信号，所述方法还包括： a) 从所述光学装置发送所述第二激发波长范围内的第三生成光穿过所述组织到所述植入物； b) 响应于所述第三生成光，测量从所述植入物发射的所述第二发射波长范围内的第三光学信号； c) 从所述光学装置向所述组织中发送在所述第二发射波长范围内的第四生成光；以及d) 响应于所述第四生成光，测量从所述组织发射的第四光学信号，所述校正的信号值还根据所述第三光学信号和所述第四光学信号来计算。 10. The method according to claim 1, wherein the first excitation wavelength range of the excitation wavelength range, the emitter emission range is a first range, and the implant is configured to respond to receiving the second excitation signal excitation wavelength range, a second transmission signal having a transmission range, the method further comprises: a) generating from said third optical means transmitting the second excitation wavelength range passes through the tissue to the said implant; b) generating light in response to the third, measured from the optical signal within said third material emitted from the second emission wavelength range of the implant; c) tissue from the optical device to the transmitting a fourth light generated in the wavelength range of the second transmission; and d) generating light in response to the fourth, the fourth optical measurement signals emitted from said tissue, said correction value is further based on the signal said third optical signal and the fourth optical signal is calculated. 11. 根据权利要求1所述的方法，还包括： a) 从所述光学装置向所述组织中发送在所述激发波长范围内的第三生成光;和b) 响应于所述第三生成光，测量从所述组织发射的在所述激发波长范围内的第三光学信号，并且所述校正的信号值还根据所述第三光学信号计算。 11. The method according to claim 1, further comprising: a) transmitting a third light generated in the wavelength range of the excitation from the optical device to said tissue; and b) in response to the third generation light emitted from the tissue measurement is also calculated in the excitation signal value of the third optical signal wavelength range, and the correction according to the third optical signal. 12. —种用于监测埋置在哺乳动物身体的组织中的植入物的光学检测装置，所述植入物被配置成响应于接收到激发波长范围内的激发信号，发射处于发射波长范围内的分析物相关光学信号，所述装置包括： a) 第一光源，被配置成发送所述激发波长范围内的第一生成光穿过所述组织到所述植入物； b) 第二光源，被配置成发送第二生成光到所述组织中，所述第二生成光在所述发射波长范围内；以及c) 至少一个检测器，被配置成：（1)响应于所述第一生成光，测量从所述植入物发射的所述发射波长范围内的第一光学信号，以及⑵响应于所述第二生成光，测量从所述组织发射的所述发射波长范围内的第二光学信号。 12. - kind of optical detection device monitors embedded in the mammalian body tissue implant, said implant being configured in response was received within the excitation wavelength range of the excitation signal, emitted at the emission wavelength range analytes associated optical signal therein, said apparatus comprising: a) a first light source configured to transmit the generated first excitation wavelength range passes through the tissue to the implant; b) a second a light source configured to generate a second light transmitted into the tissue, the second generating light emission in the wavelength range; and c) at least one detector is configured to: (1) in response to the second generating a light to measure the implant from the optical signal transmitted by the transmitter within a first wavelength range, and generating ⑵ response to the second light emitted from the tissue measuring the emission in the wavelength range a second optical signal. 13. 根据权利要求12所述的装置，还包括至少一个处理器，所述处理器被配置成：（1)接收表示所述第一光学信号和所述第二光学信号的数据，以及(2)根据所述第一光学信号和所述第二光学信号计算分析物的量或浓度中的至少一个。 13. The apparatus according to claim 12, further comprising at least one processor is configured to: (1) receiving data representative of the first optical signal and the second optical signal, and (2 ) based on the first optical signal and the second optical signal calculated amount or concentration of the analyte in at least one. 14. 根据权利要求12所述的装置，其中所述第二光源和至少一个检测器被配置成使得所述第二光学信号行进延伸到所述组织中的深度基本上等于所述植入物被埋置处的深度的光路。 14. The apparatus according to claim 12, wherein said second light source and at least one detector is configured such that the second optical signal travels to extend the depth of the tissue implant is substantially equal to the the depth of the light path at the buried. 15. 根据权利要求12所述的装置，其中所述第二光源和至少一个检测器被配置成使得所述第二光学信号行进延伸到所述组织中的深度大于所述植入物被埋置处的深度的光路。 15. The apparatus according to claim 12, wherein said second light source and at least one detector is configured such that the second optical signal travels to extend the depth of the tissue is greater than the implant is buried at a depth of an optical path. 16. 根据权利要求15所述的装置，其中所述光路延伸到在皮肤的表面之下Imm至5mm的深度。 16. The apparatus according to claim 15, wherein the optical path extends to a depth below the surface of the skin to 5mm Imm. 17. 根据权利要求12所述的装置，其中所述至少一个检测器包括第一检测器，所述第一检测器和所述第一光源共同被配置成使得所述第一光学信号行进第一光路，所述装置还包括： 第三光源，被配置成发送所述激发波长范围内的第三生成光到所述组织中；以及第二检测器，被配置成响应于所述第三生成光，测量从所述组织中发射的所述发射波长范围内的第三光学信号，所述第三光源和所述第二检测器共同被配置成使得所述第三光学信号行进第二光路，该第二光路从所述植入物被横向间隔开使得所述第三光学信号不包括来自所述植入物的显著贡献。 17. The apparatus according to claim 12, wherein the at least one detector comprises a first detector, the first detector and the first light source is configured such that the common optical signal first travels a first an optical path, said apparatus further comprising: a third light source configured to transmit the third excitation light generated in the wavelength range to the tissue; and a second detector configured to generate light in response to the third the measurement of the emission from the tissue in the optical signal transmitting within the third wavelength range, the third light source and the second detector is configured such that the common third optical signal travels the second optical path, the a second optical path from said implant being laterally spaced such that the third optical signal does not include a significant contribution from the implant. 18. 根据权利要求12所述的装置，其中所述植入物被埋置在皮下组织中，并且所述第二光源和至少一个检测器被配置成使得所述第二光学信号行进延伸到所述组织中的深度大于或等于皮肤的表面之下3_的光路。 18. The apparatus according to claim 12, wherein the implant is embedded in the subcutaneous tissue, and the second light source and at least one detector is configured such that the second optical signal to travel to extend the depth beneath the surface of said tissue is greater than or equal optical path 3_ the skin. 19. 根据权利要求12所述的装置，其中所述至少一个检测器包括第一检测器，并且所述植入物被埋置在所述组织中的第一深度处，所述装置还包括： a. 第三光源，被配置成发送第三生成光到所述组织中；以及b. 第二检测器，被配置成响应于所述第三生成光，测量从所述组织发射的第三光学信号，所述第三光源和所述第二检测器共同被配置成使得所述第三光学信号行进延伸到所述组织中第二深度的第一光路，所述第二光源和所述至少一个检测器被配置成使得所述第二光学信号行进延伸到所述组织中第三深度的第二光路，所述第二深度不同于所述第一深度和所述第三深度。 19. The apparatus according to claim 12, wherein the at least one detector comprises a first detector, and the first depth of the implant is embedded in the tissue, the apparatus further comprising: . a third light source configured to generate a third light transmitted into the tissue; and b. a second detector configured to generate a response to the third light, emitted from the measurement of the third optical tissue signal, the third light source and the second detector is configured such that the common third optical signal travels to the first optical path extending in said second tissue depth, the second light source and the at least one the detector is configured such that the second optical signal to travel to the second optical path extends in a third tissue depth, the second depth different than the first depth and said third depth. 20. 根据权利要求13所述的装置，其中所述植入物被埋置在所述组织中的第一深度处， 所述第二光源和至少一个检测器被共同配置成使得所述第二光学信号行进延伸到所述组织中第二深度的光路，并且所述处理器还被配置成根据表示从所述植入物发射的分析物不相关信号的测量结果的数据来确定所述第一深度。 20. The apparatus according to claim 13, wherein the implant is embedded in the tissue at a first depth, the second light source and at least one detector is configured such that the second joint the optical signal travels into the tissue extending a second depth of the light path, and the processor is further configured to determine from the data representing the results of the measurement of the analyte was uncorrelated signal transmitted to the first implant depth. 21. 根据权利要求13所述的装置，其中所述处理器还被配置成通过根据表示从所述植入物发射的分析物不相关信号的测量结果的数据来分配量或权重到表示所述第二光学信号的数据来计算校正的信号值。 21. The apparatus according to claim 13, wherein the processor is further configured by data representing the measurement result from the analyte was uncorrelated signal transmitted to the implant or weight distribution amount indicating the data of the second optical signal to calculate a corrected signal value. 22. 根据权利要求12所述的装置，其中： 所述分析物相关光学信号是第一分析物相关光学信号； 所述发射波长范围是第一发射波长范围； 所述激发波长范围是第一激发波长范围； 所述植入物被配置成响应于所述第一激发波长范围内的激发光，发射处于所述第一发射波长范围内的所述第一分析物相关光学信号； 所述植入物还被配置成响应于第二激发波长范围内的激发光，发射处于第二发射波长范围内的至少一个分析物不相关光学信号，所述装置还包括： a) 第三光源，被配置成发送所述第二激发波长范围内的第三生成光穿过所述组织到所述植入物，所述至少一个检测器被配置成响应于所述第三生成光，测量从所述组织发射的所述第二发射波长范围内的第三光学信号;和b) 第四光源，被配置成发送第四生成光到所述组织中，所述第四生成光在所述第二发 22. The apparatus according to claim 12, wherein: the analyte correlation optical signal is a first analyte associated optical signal; emission wavelength range of the first emission wavelength range; excitation wavelength range of the first excitation wavelength range; the implant is configured to respond to the first excitation wavelength range of the excitation light emission in the first emission wavelength range of the first analyte associated optical signal; the implant was further configured to respond to the excitation light in a wavelength range of the second excitation, the emission is not related to the optical signal of at least one analyte within a second wavelength range emitted, said apparatus further comprising: a) a third light source configured to sending the third generated in the second excitation wavelength range passes through the tissue to the implant, the at least one detector is configured to generate a response to the third light emitted from the tissue measurement third optical signal within said second emission wavelength range; and b) a fourth light source configured to generate light transmitted to the tissue of the fourth, the fourth generating light at the second hair 射波长范围内，所述至少一个检测器被配置成响应于所述第四生成光，测量从所述组织发射的第四光学信号。 The reflection wavelength range of the at least one detector is configured to generate light in response to the fourth, the fourth optical signal transmitted from the tissue measurement. 23. 根据权利要求13所述的装置，其中： 所述至少一个检测器还被配置成响应于发送到所述组织中的第三生成光，测量从所述组织发射的所述激发波长范围内的第三光学信号，以及所述处理器还被配置成根据表示所述第三光学信号的数据计算分析物的量或浓度中的至少一个。 23. The apparatus according to claim 13, wherein: said at least one detector is further configured to respond to the third generation of light in the tissue, the measured tissue transmitted from the excitation wavelength range a third optical signal, and the processor is further configured to operate according to the data representing the third optical signal calculated amount or concentration of the analyte in at least one. 24. 根据权利要求12所述的装置，其中所述第一光源、所述第二光源和所述至少一个检测器被布置在被放置在皮肤的表面上的传感器贴片中。 24. The apparatus according to claim 12, wherein said first light source, the second light source and the at least one detector is arranged in a sensor patch is placed on the surface of the skin. 25. 根据权利要求1所述的方法，其中： 所述第一生成光由所述光学装置的第一光源发出；并且所述第二生成光由所述光学装置的第二光源发出。 25. The method according to claim 1, wherein: generating the first light emitted from the first light source of the optical device; and generating said second light emitted from the second light source of the optical device. ES2288251T3 (en) 2003-02-14 2008-01-01 Eyesense Ag Apparatus for measuring a concentration of analyte from an ocular fluid.